This speck is made in Iowa by award-winning cured meat artisans Herb and Kathy Eckhouse. 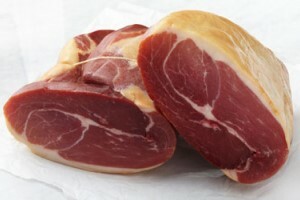 Speck Americano is cured for 8-10 months (35 weeks minimum) while Speck Alto Adige is cured a minimum of 20 weeks. Time of aging is one factor that can influence richness of flavor. The flavor is wonderful - buttery and rich. NOTE: Specks are often not exactly the indicated weight; we'll therefore charge your credit card according to the weight of the ham that will be shipped to you.